A handful of international and local manufacturers with limited shares dominate the global diabetic neuropathy market. This makes the competitive landscape semi-consolidated in nature. The competition among them is intense with most spending time and money on research and development of more effective neuropathy drugs. The global diabetic neuropathy market is being primarily driven by changing lifestyles which has mostly resulted in unhealthy dietary habits and patterns. As per WHO, about 422 were afflicted by diabetes in 2014. Apart from that, other growth drivers in the market are the approval of novel drugs to treat neuropathic pain and supportive reimbursement policies. Drugs administered to treat neuropathic pain, however, so far have had only limited success in terms of pain relief. This coupled with erroneous diagnosis or selection of treatment and side effects and rising cost of diabetic neuropathy treatment drugs are posing a hindrance to the market for diabetic neuropathy market. A report by Transparency Market Research, forecasts the global diabetic neuropathy market to become worth US$5.718 bn by 2024 from US$ 3.6 bn in 2016 by rising at a steady CAGR of 5.4% between 2017 and 2025. Peripheral neuropathy, autonomic neuropathy, proximal neuropathy, and focal neuropathy are the prominent disorders in the global diabetic neuropathy market. Peripheral neuropathy, of them, accounts for almost half the share in the market at present. In the near future it is predicted to grow its share marginally by surpassing all other segments in terms of growth rate. The report by TMR predicts the segment to clock a 5.7% CAGR from 2017 to 2025 because of the high prevalence of diabetic neuropathy. Proximal neuropathy follows peripheral neuropathy when it comes to market share in the global diabetic neuropathy market. This is because proximal diabetic neuropathy is the most commonly found disorder in type 2 diabetes. The segment was worth US$885.6 mn in 2016 and will likely rise to US$1.405 mn by 2025 by expanding at a CAGR of 5.4% from 2017 to 2025. 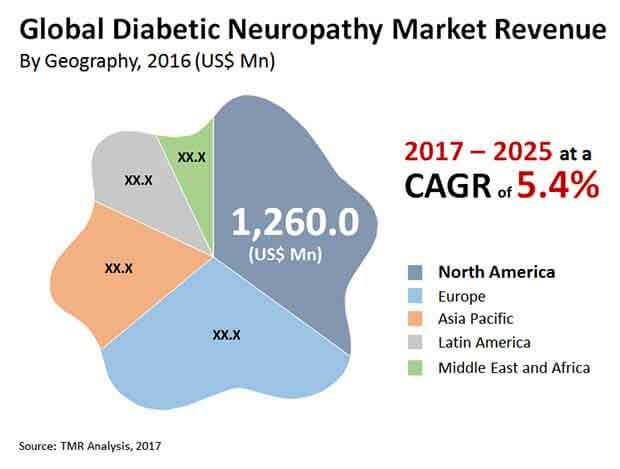 Key regional segments in the global diabetic neuropathy market are North America, Latin America, Europe, Asia Pacific, and the Middle East and Africa. Among them, North America accounted for a market leading share of 34.9% in 2016. This is mainly on account of the large pool of patients who have been diagnosed and the expensiveness of therapy. In fact, keen companies are eyeing the market in U.S. in the region to up sales and revenues. The market in North America was worth US$1.071 bn in 2016 and rising at 5.3% CAGR between 2017 and 2025, it is slated to become worth US$1.68 bn by 2025. Europe trails North America in the global diabetic neuropathy market in terms of size. Its market has been mostly driven by the rising occurrence of diabetic neuropathy and a growing pool of elderly, particularly in countries of Italy, Germany, France, and the U.K. In terms of growth rate, however, the market is Asia Pacific is predicted to outshine all others. Powered primarily by China, Asia Pacific will likely clock a CAGR of 6.7% on account of the growing number of healthcare awareness programs, hospitals equipped with radiology devices to treat diabetic neuropathy, and a large pool of patients. Some of the key names operating in the market are Pfizer, Inc., Johnson & Johnson, Boehringer Ingelheim GmbH, NeuroMetrix, Inc., Astellas Pharma Inc., Eli Lilly and Company, GlaxoSmithKline plc, Lupin Limited, Depomed, Inc., Glenmark Pharmaceuticals Ltd, and Arbor Pharmaceuticals, LLC.